How to show grid on powerpoint? activation grid line on powerpoint can help you make a proportional shape, you can balance your graph in powerpoint especially when you made your own template. After you activation or show grid line on powerpoint, you can also make a good shape from a align technique. This two technique is very useful for you making a good powerpoint. 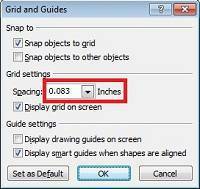 How to show grid on powerpoint, i will show you. 3. change setting you want. This grid line will help you to arrange picture on powerpoint, in my opinion, this grid must activation each you make presentation on powerpoint. So, i hope this help you to show grid on powerpoint.